Almost all of us would like whiter and brighter teeth. If you’ve noticed that your teeth have discoloured, you may have gotten into the habit of smiling without showing them, or even covering your mouth. Tooth whitening by your hygienist can be a simple, safe and quick way to refresh your smile. 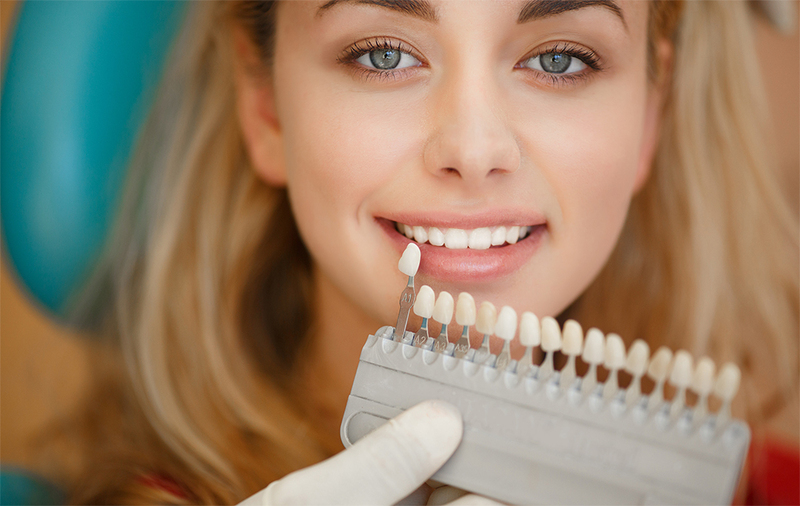 There are many reasons why our teeth become discoloured or stained over the years. Some people are simply born with yellow teeth and others yellow as they age. In other cases, lifestyle factors may be the main culprit – including diet, general health, and also if our teeth have taken a knock during sport or some other activity. Teeth are made up of three layers: outer enamel, softer dentine, and the inner pulp. As we get older, enamel thins through wear and tear, and the darker dentine layer can begin to show through. This process can make older teeth appear yellow. Although there are plenty of ‘whitening’ toothpaste and mouthwashes available, these are designed to help only with surface stains. Though these products can remove such stains, they are usually not effective in situations where teeth discolouration is deeper than the enamel. You may have heard of home DIY bleaching kits, or teeth whitening procedures at cosmetic and beauty clinics. These kits chemically whiten the teeth, and come in varying levels of strength. Why see a dental hygienist for whitening? Dental practitioners are qualified to thoroughly assess the status of your teeth, including taking a dental history and checking that the strength of the bleaching products used on your teeth will be correct and most effective for you. They are also qualified to check for problems such as cracked enamel, cavities, restorations and exposed root surfaces that need special care. Here at Fresh, teeth whitening is one of the most popular procedures we get asked for and it’s no surprise – not a day goes by where I don’t get asked “how do I whiten my teeth?’. We have two options available: Zoom Whitening – a fast and convenient in-surgery treatment ¬– and our Bright Smiles for Life take-home kits which you can use in the comfort of your own home. Zoom Whitening is the more popular and quick way to whiten your teeth. It is performed by in one visit to the surgery in one hour, taking you up to six to eight shades whiter. The procedure has proven to be very popular among the Coffs Coast because it is fast, simple and convenient. It is performed by our hygienist and leaves you with instant and lasting results. Our cost-effective alternative is called Bright Smiles For Life, and allows you to whiten your teeth at home at a time that suits you. We will have you come in for dental impressions, from which we make trays moulded to your teeth, and give you these to use at home. The trays are designed to be worn daily for up to 90 minutes, for up to two weeks. Two syringes of product are included. You will receive a complementary syringe at your six-monthly continuing care appointments. These will allow you to boost your shade. Understandably, this is the most common question we get asked. Any whitening treatment will need a form of maintenance regime to stay white and bright and we have allowed for this in both the treatment options. Zoom Whitening should take you six to eight shades whiter for a two to five-year period. During this time, the colour may go back two to three shades over time and due to lifestyle habits. For this reason, included in the Zoom cost are trays containing a 14% hydrogen peroxide treatment that can you can wear for as little as 15 minutes to boost the shade back. Bright Smiles For Life needs a regular maintenance regime every six months or so once you have reached you optimal whiteness. There are other things you can do to ensure your fresh-looking smile lasts. Along with good oral hygiene, regular dental cleans will help keep your teeth white as long as possible. However, diet, ageing, alcohol, smoking, medication and many other factors may influence the longevity of your pearly whites. Tooth sensitivity from whitening can vary between product and treatment system as well as the individual patient. Occasionally, teeth may become temporarily sensitive following a whitening treatment at the dentist. Sensitivity varies from patient to patient and can feel like a mild tingling or can come as a short, sharp flash. The good news is that we provide all patients with products to reduce these symptoms if they occur. More importantly, the sensitivity is only temporary and for most patients it usually eases up after 24-48 hours. Most people tell us the overall whitening process is worth every minute, however, and they love their new refreshed smile! Are you thinking of whitening your teeth? Give us a call on (02) 6651 1350 for a chat about the options.